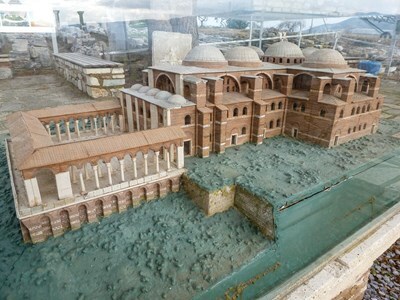 The Basilica of Saint John is located on the citadel (called Ayasoluk) of the Turkish city of Selçuk. It was constructed by the Byzantine Emperor Justinian (r. 527–565). It was built over the "supposed" tomb of John the Theologian—the writer of the New Testament books of Revelation, John, and 1, 2, 3 John. It is thought that John died ca. A.D. 100 and was buried here.